Gamesa and AREVA announce today that they have signed the definitive agreements and have closed the transaction for the creation of Adwen, a joint venture dedicated to offshore wind, having 700 employees, 50-50 owned by its two parent companies and registered in Zamudio, Spain. Adwen is chaired by Louis-François Durret, CEO of AREVA Renewable Energies and the Board of Directors is composed of eight members, four appointed by each parent company. 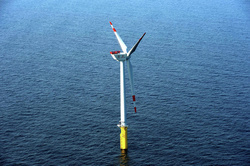 The General Manager is Luis Álvarez, Chief Operating Officer of Gamesa’s offshore activities. Adwen has corporate offices in France, Spain, the UK and Germany. Adwen will manufacture these turbines in its existing plants in Germany, Bremerhaven and Stade, ideally positioned to equip North Sea and Baltics projects. The company will fulfill industrial commitments engaged by AREVA and Gamesa, in France and in the UK, comprising the creation of factories in Le Havre and the implementation of a network of suppliers and partners throughout the country.